This has original advertising label on it for Hartz Mountain Bird Foods. Colors are nice and bright on that. There is wear around the edges of that advertising. This type of cage would have been used in the coal mines to detect deadly mining gases. There are actually two birdhouses because there are two walls inside, the center opening possibly held seeds. 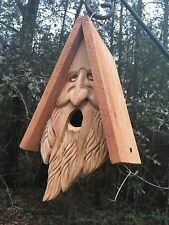 Antique Colored Primitive Wooden Bird House. Made by a MAC Apple geek back in the 80's . Still has lots of life left.very cool. Great gift for a Apple Mac Computer Geek. 6" tall on sides. This birdhouse will arrive with the rooster unattached. It is inside of the birdhouse and assembles easily by screwing into the top hole. Expect chippy, uneven paint as this is the style this birdhouse was made in. How wonderful is this Birdhouse style bird house! It is nicely sized at just under 15" tall x 8 1/4" across x 6 3/4" deep and features a handy hook with a 24" chain. This would be perfect for indoor or outdoors. You are viewing an all cedar hand carved bird house. It has a 1 1/4 to 1 1/2 hole in the mouth to allow small birds in with plenty of space. The bottom is removable to let you clean it out as needed. The paint on the front door is distressed but overall, it is in nice pre-owned condition. The owl is made from sturdy wire rods bent into shape. · A super fun yard art piece that will be fun to watch. GARDEN DECOR TEA CUP FLOWER POT PLANTER OR BIRD FEEDER -7.5'' X 4''H. ADORABLE TEA CUP BIRDFEEDER OR HANGING POT FLOWERS PLANTER. CUTE GIFT IDEA! Very nice and in great condition! This is suitable for inside or outside display but it does not open for cleaning. You are viewing an all cedar hand carved bird house with hair. It has a 1 1/4 to 1 1/2 hole in the mouth to allow small birds in with plenty of space inside. I have carved hair on this bird house to give him an even more personality. vintage Victorian domed wicker rattan bird cage cottage 45"
You are bidding on a Vintage Rustic Green Twisted Metal Wire Bird Cage Garden Decor Hanging / Table. Condition is Preowned Measures Total without chain is 16 1/4” tall by 10” wide by 12” long Stands off ground 7 1/2” Cage only measures 7” by 9” by 8 3/4” Chain measures 6 1/2” In very nice shape. Lots of decorative details. It is rustic patina looking w green paint. Does show some rust. Can be hung or set on a table. Door opens and closes and there is a swing on the inside Please only bid if you plan on paying. Payment is expected within two days of auction ending. I will not ship package until payment is received. Please email me with any questions thanks and happy bidding. And Can be hung from 15" of chain (chain included), or will sit level on a tabletop. This would accent any area outside hanging or can sit also, very neat design and is distressed so know this, will have marks in finish and distressed finish, are made this way. 2 FEEDERS, A LADDER TO CLIMB, A PERCH, 3 DOWELS, AND A FUNNY TOY WITH A BELL. This is suitable for inside or outside display and features a hinged door on the back with a 3" x 3" square opening for cleaning. Really nice Bamboo top hinged bird cage. Great as a table top or hanging bird cage but also a great display item for. 11.0" tall. arts and crafts projects. You are viewing an all cedar hand carved bird house. It has a 1 1/4 to 1 1/2 hole in the mouth to allow small birds in with plenty of space inside. I have carved hair on this bird house to give him an even more personality. Vintage Crown Metal Dome Bird Cage Pet Parakeet Canary Lovebird Bars Mirror Old. Measures 15” by 15” by 8”. See pictures for Condition of cage and for details or ask any questions. Needs cleaning. Thanks for looking. Glazed pottery birdhouse designed by Rae Dunn for Magenta.with the word 'BLOOM' under the entrance hole and a graphic stem with leaves on the back. Rubber plug is on the bottom. MAGENTA RAE DUNN ARTISAN BLOOM CERAMIC DECORATIVE BIRDHOUSE. Hand painted ivy Rustic Wood Bird House 9" tall, 4.5 wide, indoor decorative, Heavy. Main section made from 4 x4 solid wood block. Shipped with USPS First Class Package (2 to 3 business days). Birdcage seed feeder or treat feeder. Treat cup. Large Chinese, I think, bird cage made of cane or rattan. It is 19" from the bottom to the top of the cage, then you add 8" more for the hook. It is 16" across. The door is 3 1/4" wide and 9" tall. The cage is made up of all Brass metal. Measuring 37” Tall by 10”x10” total weight 15lbs.Listing is for what you see in picture. Will need to be polished and cleaned.Expect some kind of wear from use. Good condition. How wonderful is this Birdhouse style bird feeder! It is nicely sized at 14.5" tall, 9.5" across and 6" deep. The bottom tray is open for birdseed. The top features a front hole and perch (this does not open for cleaning). Previously displayed cage in good condition. This is a decorative bird house, but is a great addition to a Christmas village. Neat old feeder. A couple spots of damage but still looks great. Bid confidently with my stellar feedback! Vintage Victorian Wooden Bird Cage PLANTATION Style 17" x 20" x 11"
Very sturdy, heavy, well built. Door opens. Two wood perches. Great piece of decor and still capable of holding birds. This piece has not been varnished or otherwise painted. Saltbox Birdhouse Kit - Reg 19.95. Attracts nuthatches, titmice, and similar sized birds. Carriage House Bird Feeder Kit - Reg. Size 8 3/4" W x 7 1/4" D x 8 1/2" H.
Cricket Cage 6" Tall Wire Tube. Fishing Line. Check-Out Now! What happens after I have paid for my item?. We are located in Stuart Florida. John B Outdoors looks forward to serving you. Helpful Links. Suitable for inside or outside applications. Suitable for indoor or outdoor use, the hole is about 2" across. This item is welded and does not open for cleaning.